Create a monitoring station to measure weather, soil, seismic, solar, magnetic, and gravity conditions - focus best accuracy/dollar w/COTS. This project was created on 12/07/2016 and last updated 25 days ago. Create a system with commonly available sensors and hardware in conjunction with good engineering to get the best accuracy reasonable. How will this be different from the thousands of very good DIY weather station projects? I grew up "pre-digital" so am a bit obsessed with true accuracy and not just resolution. This project will attempt to include an error band estimate for any measurements. The overall goal will be to have a "meteorological" quality station that is in reach for any hobbyist. A second goal is to have the fun of adding other data sensors for the environment as well. An old saying from my mother was, "In for a penny, in for a pound". Since I have gotten accustomed to Hackaday.io as a workflow blog, I decided to put up another of my ongoing projects. This one grew out of my frustration with the expense, inaccuracies, and closed approach of various personal "Weather Stations". I have owned several Davis versions and, most recently, a Peet Bros. unit. That means you will need to overlook the scattered approach to the first few postings as they were a data dump of that happened up to 2016. Sadly I did not have anything ready on this for Hurricane Harvey. Even my new calibrated tipping bucket rain gauge failed. The old school approach was the 18ft swimming pool at the bunkhouse. It was empty on Friday Aug 22 and full to the 42 inch line on Tue Aug 26. Oh well, I will have it ready for the next one. It has been several decades since I did a complicated Karnaugh Map to lay out a digital circuit. Which means it took a lot of time and review to get the knowledge brought back to the front of my memory and skill stack. Anyway, the concept for the circuit was deceptively simple. The way the sensor works it it has two magnets and two reed switches. One sensor physically aligned with north for the wind speed rotor and one for the direction vane. The number of counts per minute of the rotor vane is a representation of the wind speed. The wind rotor also has a magnetic shield that extends up into the direction vane. This means the direction switch will close once each revolution when the rotor aligns with the direction. The time difference between the two closures is therefore the proportion of the circle between north and the direction vane. Clever and patented. The beauty of this approach is the significant resolution improvement over more traditional multi-switch direction sensors or drag and friction in potentiometer sensors. It allows the entire assembly to be completely sealed from the elements and corrosion. The circuit to use the Peet style anemometer needs to respond quickly, since at high wind speeds and directions near to north, the time between pulses can be very short. In order to get the resolution I wanted, it was too short for an Arduino. It would likely work on the faster MCUs like the ESP series. However, that still would not resolve any variability in processing timing to count the time. So I decided on simple "jelly bean" digital logic as an inexpensive and reasonably stable timing platform. I have attached my prototype circuit (done in Logisim-Evolution) and it will be the basis for the first breadboard circuit. Once I have gone through the necessary datasheets and part selection I will include those parts in the list and do a Kicad schematic. It has taken me a lot longer to understand the accuracy specifications of the various sensors I need to compare and/or choose from. A lot of this is because the manufacturers leave details out of the datasheet when they specify accuracy. For example is the ± 0.1 ºC an absolute accuracy, a standard error, or what? And if they bin their sensors to fall within that accuracy, what sample standard deviation is allowed, etc. Thankfully Sensirion has that information available if you dig deep enough. It will not show up on a Google search or a search of their website. However, I did finally find it in the certification part of the Quality Control section of their website. From what I can understand, they use a 95% confidence error on a sample group to generate their specified tolerance. Hooray for Sensirion! They are doing things right and I can now use their sensors with reasonable expectations of repeatability and proper accuracy estimates. This all is a bit esoteric and unnecessary for a simple home weather station. But since this project is aiming for a station that has calculable uncertainties, it is quite important. For example, each of the various sensors (e.g., pressure, humidity, temperature, etc.) generally output temperature. Each has a different error band though. By having statistically calculable error bands, all of these temperatures can be statistically compiled with a specified confidence interval and that will improve the station readings dramatically. All of that means better accuracy with a lower cost. Just found out about the Citizen Weather Observation Program (CWOP) hosted by NOAA. The have a wealth of data that I am working my way through. In particular the previous project logs show my concern with accuracy for wind speed and relative humidity. It turns out that those concerns were well placed as they are difficult things to accurately quantify. Having a wet bulb system really adds to the complexity, but seems unavoidable if reliable low cost humidity measurements above 80% RH are needed. On the other hand, the wet bulb system falls short of design goals for very dry (less than 15%) areas like deserts and for RH measurements below freezing. My hope is that the membrane sensor will fill in those weaknesses. My current plan is to use common PVC fittings for the aspiration system because I don&apos;t want to take the time to learn enough 3D software to model it for 3D printing. Just finished concept review for the anemometer input. As I noted, some form of input conditioning will be required (and maybe isolation?). When I did the spreadsheet to look at the time intervals per rotation across the range of the instrument I found that a low clock speed counter is all that is required. I also did an complex math curve fit to the calibration data from the manufacturer to allow me to look at the edge cases and what timing would be required. What I found is that for this particular anemometer sensor the curve "bottoms out" at a smidgen above 1 mph. But from my experience in the past I think that anything below 1.5 MPH (0.67 m/s) is unlikely to be useful. Wear, bearing drag, dust/dirt, etc. all create a start-up drag that is unpredictable. The sensor is also unlikely to realistically survive at much above 100 MPH, so I looked at that and 120 MPH (45-54 m/s). When using a period counter for timing, this upper speed limits the resolution at the top end and the starting speed creates the maximum count required without roll-over. By balancing these two factors it led to a clock speed choice of between 30-60 Hz and a 16 bit count. 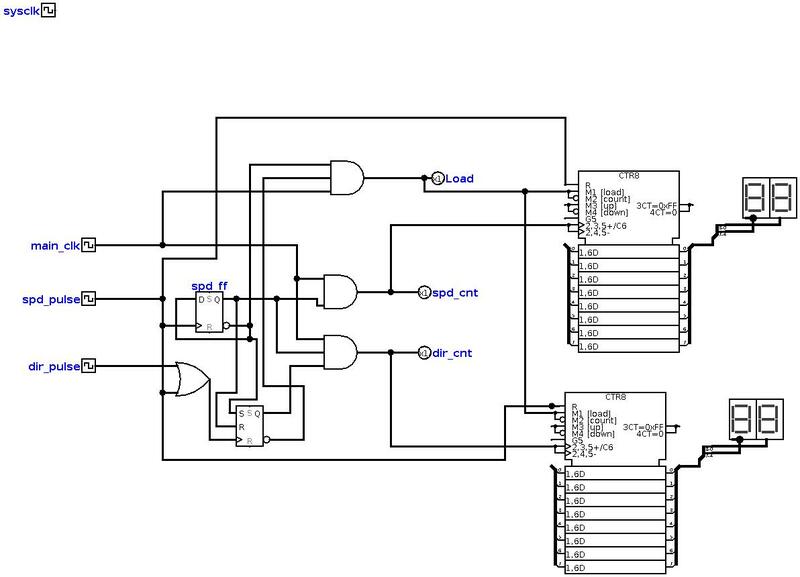 This can be achieved with about $5 of logic level integrated circuits (ICs). I found a nice clock generator with an inbuilt divider that is programmable from 0-22 bit with an internal clock. When I put that in my spreadsheet for the anemometer, it gave optimum results with a divider of 15. That will output a clock of 31.9824 Hz leading to a count range of 59,921 to 625 across the desired range. I plan to couple this with a Schmitt trigger and debounce input. Then a parallel to I2C output finishes the process. Also I selected a D-style latch that can be used to get the time count from the start of the rotation to the direction arrow pulse. The time between these when compared to the time between speed pulses gives the wind direction (by multiplying that ratio times 360). Oops, I just realized that the direction resolution will be dependent on the minimum number of clocks per revolution. So I need to modify and re-validate my spreadsheet. Once the wiring schematic is roughed out I will order the parts to breadboard it. and I have an HX711 load cell sensor working. The load cell will be used for a subset of this project and used for bee hive monitoring. All of the above components have been working together and I am now in the process of building a proper software framework for the final project code. Things have now gotten complex enough that I have begun outgrowing the "quick and dirty" code in the Arduino IDE. As a result I got an Eclipse instance working and installed the wonderful Sloeber plug-in. My future code development will be there. I also have started a github repository where I will put any code that is not fully embarrassing, as well as project documentation and spreadsheets. Status - most recently I began real-world testing of the DHT22 sensor, thinking it would be a less costly option for the bee hives. Sadly they fail fully in our weather. Here in the Houston, Tx area we often have long periods of very high humidity. I have placed several DHT22s outdoors. They are under a roof so they are not subject to rain, any direct moisture and we are too far inland to have salt air. Thus far all of them have begun giving false humidity readings after a day or two. Our typical day has been between 70% and 100% humidity with the temperature between 70F (21C) and 94F (34C). In the failure mode the sensors continue to give humidity readings but the readings are about 15% RH too high. It appears this is a saturation problem and basically renders them useless for anything except air conditioned spaces. I have not tried to recover them or recalibrate them because I want a reliable sensor and will not be using these for the foreseeable future. I did a bit more thinking about the anemometer. The way the units I have (and have seen) work is by closing a reed switch with a magnet on the rotating cups. Both of them use the rotation speed to convert to wind speed. The interesting thing about wind speed versus rotation speed in an anemometer is that it is a "segmented" equation. In my mind I see it as analogous to a pump curve in fluid flow. What you see in both cases is a low flow regime where the inertia and friction forces dominate. In the middle region the movement is controlled by a "positive displacement" line. Then at the higher speeds you begin to see the effects of drag and edge spillage dominate. The anemometer I am going to re-purpose is from Peet Bros., but the concepts and equations would be the same for my old Davis unit or even one that was DIY. Only the constants would change. For my anemometer the change from "slow" to "middle" happens about 8 MPH. The shift from "middle" to "high" happens at 135-ish MPH. However, at that speed the anemometer would have long since self-destructed. Therefore I am only going to look at the range from calm to 110 MPH. When I do the math from the anemometer equations (which I will upload later in the project when I have cleaned up my ugly spreadsheet), I find that across the wind range of 1.5 MPH to 110 MPH, the output will vary between about 0.5 pulses per second (PPS) up to 145 PPS. That is too slow to easily measure as a frequency but will be easy to do as a period measurement which is then inverted in software to be a frequency. The bottom of the range at 1.5 MPH is likely below the speed required for the wind to overcome the friction in the anemometer and start it turning. 0.5 seconds is 2000mS and on the upper end of 145 PPS, that would be about 7 mS. That is a very large range for a sensor, but not a problem for software. Using a non-blocking interrupt counter on the Arduino will likely be all that is needed, apart from input conditioning. On the other hand, since the input will need some passives and a Schmitt trigger to condition the input, it would be very easy to add a gated counter and handle the counting at the input before "bothering the Arduino" with an interrupt. I need to look at the pros/cons of that. Any method used will need to gracefully handle a rollover condition in the counter for times when the wind is calm or too slow to turn the anemometer. What I need now is an inventory of all the interfaces that my potential sensors would require. I took the list from the previous log and put it in a spreadsheet. Then I went through each datasheet and looked at the interfaces. From this I can now do a quick look to see what interfaces I need to augment for the Arduino style inputs. The Arduino A/D system does not have the accuracy or range this project needs so an outboard chip will be required. From the above I can see an 8 input multiplexed IC with an I2C interface would be a good choice. For example I will look further into the $2 TI ADC128D818. The various photodetectors will be used to measure the illumination with a rough spectral breakout. In other words IR, R, G, B, and UV. The Watermark sensors will be placed at a depth of about 1m (3ft) and 20cm (8 inches) to give a relative measurement of soil moisture in the tree root zone and grass root zone, respectively. The waterproof temperature sensors will be buried along with them for soil temperature measurements. Separate to this project I will follow with an evaporation pan system to allow estimations of leaf water loss. The current project should have an interface to allow other sensors like the evaporation system to "just plug in". The GPS module would be used to provide very accurate real times for data timestamping. It could also monitor any location deviations for inexpensive precision differential GPS. This would be a big help for things like bee hive siting, tree planting, fences, etc. Relative humidity and dewpoint are notoriously difficult to measure accurately. The reason for having two high accuracy temperature sensors is to allow the construction of a dry bulb-wet bulb arrangement. This will allow traditional methods to be used as well as the digital humidity sensors. I am curious to see what the comparative levels of accuracy are. The microphone output will be monitored for large peaks (like thunder) which could enhance the data from the lightning detector. It will also be used for very long term (hourly?) averaging to create a baseline background noise measurement. Subjectively I have noticed a large increase in noise as the city of Houston grows nearer us. I am still researching to determine if there is a very low cost leaf wetness sensor that can be incorporated into this system. Usual sensors are simple resistive or capacitive probes (printed circuit boards), but it seems to me that they would need continuous maintenance to remove dirt and dust. What sensors do I have? I dug through my "junk box" to see what sensors I have acquired over the last couple of years. I anticipated building enhancements to the existing consumer weather stations, but found that closed software and proprietary protocols were not friendly to the process. As I mentioned that , plus the failure of my third consumer station (2 Davis & 1 Peet Bros.), motivated me to just build the complete thing. As I mentioned all of these were acquired over the last two years and ranged from a few cents at hamfests/swapmeets to about $7-12 USD for those on breakout boards. Nearly all of the above (or their improved successors) are available from Adafruit.com currently. I highly recommend them as a source for any DIY sensors and/or breakout boards for prototyping. One of the stated objectives of this project is to have high inherent accuracy to eliminate, or at least simplify, the calibration of the final station. In the discussion a suggestion was made to make this unit wireless. That is a nice goal for "Phase 2", along with solar power. However, to keep things simple and prove the concept I will make the prototype and initial station as wired with PoE. That will allow it to run on a single Cat5e direct burial cable and will allow for actual power consumption evaluation in preparation for solar power. My research on the Stevenson Screen also turned up several papers and in-depth measurement comparisons for natural measurements versus aspirated (fan driven) measurements. Surprisingly the aspirated "gold standard" was invented and has been in use since the late 1800&apos;s. A LOT of data is, therefore, available. From all this, I am leaning toward having both types of sensors in the initial proof of concept system. My conclusion from the papers is the natural aspiration tends to be good at providing stable, consistent measurements where the aspirated ones are superior in measuring rapid changes and layering. The familiar box that houses various weather instruments has an interesting origin. The father of the famous author Robert Louis Stevenson (Dr. Jekyll and Mr. Hyde, Treasure Island, etc.) was a British civil engineer who specialized in lighthouse design. He realized that the lack of standardization of how weather data was measured and recorded was causing inaccurate results and incorrect analyses. He created a standard for the small double-louvered box with no floor in the middle 1860s. It was later modified to include the double roof and was ultimately adopted as the standard for the British Meteorological Society in 1884. Apparently there have been a number of regional variants including one for the "Cotton Region" of the US. I was surprised today to find that one of the regularly cited works for that is "The Effect of Thermometer Screen Design on the Observed Temperature", W.R. Sparks. It would be fun to find out if W. R. is a distant relative of mine. According to Wikipedia the traditional interior size for a single unit (like the photo) "may be" 76.5 by 105 by 59.3 centimetres (30.1 by 41.3 by 23.3 in). In my reading of other papers it appears that there is a huge variation on those dimensions. Obviously given my current location in the Texas Gulf Coast (which may include "cotton" region), I will attempt to track down the 1972 paper on screen design and other design comparisons. Because my budget does not allow me to buy a pre-made screen. I will be designing and building my own. I have learned a lot of "life lessons" regarding the design of outdoor equipment for use here in Texas and in most of the more than 3 dozen countries I have had the opportunity to work in. More on that to come. I am having second thoughts about not doing this on WiFi. I will post to the log soon and explain my new approach. In essence the ESP8266 is a game changer for WiFi coupled with Ethernet. I now plan to do both and use an MQTT publish method for data transfer. That would be pretty straight forward as a "Phase 2" once the prototype is working well and ready for expansion before committing to a PCB. The option that pops to mind is the Adafruit FONA 3G Cellular Breakout (#2696) at about $80 US and can include free service from Ting mobile (which works on the T-Mobile or Sprint networks). The big issue would be whether there is 3G network coverage in the area where the system is setup. That is not a problem around cities, but in the areas where realtime data is sparse, network coverage may not be available/reliable and the data logging to a flash drive or card would be critical. That is why I have been focused on the logging aspect first. Thanks for the great suggestion, I will definitely look into it further once the version 1.0 is up and running. You can fill what I see as a gaping hole in economical remote weather station monitoring by having your station send its data via cell phone SMS. Every economical and DIY weather station product I&apos;ve seen always requires data network access by either wifi or a more expensive cell phone data service. Your comment was well taken. I decided to investigate the options for wireless. When I did, I found that the problem of communication method was only one piece of a huge puzzle. The protocol, the packaging method, the server, the client, local data storage, time tracking, battery consumption, and many other pieces. For now it looks easier to go wireless than to do wired, so that is what I have decided to do. Thanks for the suggestion. You are about to report the project "Climate & Environment Monitoring Station", please tell us the reason.